Loving. Inspiring. Peaceful. Joyful. Historic. Amazing. Energizing. Incredible. Those were just some of the adjectives used by the hundreds of archdiocesan pilgrims, mainly high school and college students, that participated in dozens of events — both local and national — to mark the 45th anniversary of the U.S. Supreme Court decision known as Roe v. Wade that legalized abortion nationwide. In addition to the rally and march held Jan. 19 on the National Mall, events in Washington, D.C., included a National Prayer Vigil for Life held at the Basilica of the National Shrine of the Immaculate Conception; a workshop in which students heard from Stephanie Gray about how to articulate their position on life issues; dozens of Masses offered across the city the morning of the march; an expo of pro-life advocacy organizations and vendors; opportunities to lobby members of Congress; and time to enjoy fellowship with people from across the country. The pre-march rally included several speakers and marked the first time a sitting president addressed the crowd via video stream. On Jan. 22, the actual anniversary of the court decision, the archdiocese sponsored an event at the Topeka Performing Arts Center known as the “Ignite” rally in which 1,200 junior and senior high school students from across the state came together for praise and worship music led by Wichita Adore Ministries and to hear the testimony of Melissa Ohden, a survivor of a failed saline infusion abortion attempt in 1977. After the rally, another several hundred people joined Archbishop Joseph F. Naumann, Bishop Carl Kemme of Wichita and approximately a dozen priests for Mass. Numbers only grew after Mass when participants began the march to the south steps of the Kansas state Capitol for a rally. The rally included recognition of the state’s pro-life legislators, a performance by Most Pure Heart of Mary Church’s Schola Cantorum, prayers led by the archbishop and Pastor David Epps, a shortened version of Ohden’s story and a presentation of 17 roses to Gov. Sam Brownback, a member of Christ the King Parish in Topeka. The roses were given to the governor to signify the 17,000 fewer abortions estimated to be the direct result of pro-life bills signed into law during his tenure. In his welcoming remarks at the opening Mass of the National Vigil for Life, Cardinal Wuerl thanked the young people for their attendance and participation. “Your presence bears great testimony to the importance of the gospel of life,” he said. In his homily, Cardinal Timothy Dolan, archbishop of New York and the current chairman of the Committee on Pro-Life Activities of the U.S. Conference of Catholic Bishops, expanded on the presence of the young people as being an encouragement to him and others. Elsewhere in his homily, the cardinal compared the peaceful protest of the annual march as similar to the peaceful protests of the late Dr. Martin Luther King Jr.
“Like the Reverend Martin Luther King, our prayers and witness are about civil rights, the right to life and to equal protection under the law, guaranteed by our Constitution for the most fragile, marginalized and threatened — the tiny innocent baby in the womb,” he said. “Like Pastor King,” Cardinal Dolan continued, “our belief in the dignity of the human person and sacredness of human life propels us to concern for human life wherever, whenever and however it is threatened, from racism to immigrants, from the war-torn to the hungry. The cardinal’s mention of the march as a “peaceful protest” sparked some reflection on the part of at least one archdiocesan pilgrim. Chris Spencer, a senior from St. James Academy, Lenexa, made the March for Life in Washington, D.C., somewhat differently than his peers. On Nov. 21, he underwent surgery to repair a ligament and still wears a boot on one of his legs. But he never considered canceling out on the march. At the opening Mass of the Vigil for Life, he found himself being escorted to the front of the basilica to a spot only six rows from the main altar. “That was really cool,” said Spencer, adding that he never expected to be that close. At the rally and the March for Life, Spencer’s peers took turns pushing him along the route. While he and his friends were making their way up to the U.S. Supreme Court, Spencer observed how the March for Life was, indeed, an extremely peaceful protest. As a member of St. James Academy’s football team, Spencer stood with his teammates outside an abortion clinic earlier in his academic career, praying during a “40 Days for Life” campaign. Now that he’s been to the March for Life, he definitely wants to engage more in the pro-life movement. “I want to do something. I definitely want to find something,” he said, adding he’s not sure if he will spend more time praying outside abortion clinics or volunteer for a pro-life advocacy organization. Like Spencer, Megan Ebbert, a high school freshman and member of St. Bernard Parish in Wamego, wants to get more involved, especially after participating in the Mass and March for Life. As it was also her first time to the national march, Ebbert said she was absolutely amazed by it all. Ebbert said some of her Catholic friends (who had attended the march in the past) encouraged her to participate this year. Like Spencer, she participated in the basilica Mass filled beyond capacity and found Cardinal Dolan’s homily inspiring. “There’s more to life than our selfish needs. We can be selfless for another human being,” she said, a message she thinks Archbishop Naumann reinforces regularly. “Life is not something we just can throw away,” she said. Ebbert plans to talk with her parish youth group and students at her high school about the resources available to those who find themselves in tough situations. “There’s always hope,” she said, adding she wants everyone around her to know that she is available to talk. “I’ll always listen and help them,” she said. Listening and spreading the message of life is challenging for some college students, including Cody Henry, a junior and member of the St. Lawrence Catholic Campus Center at the University of Kansas. 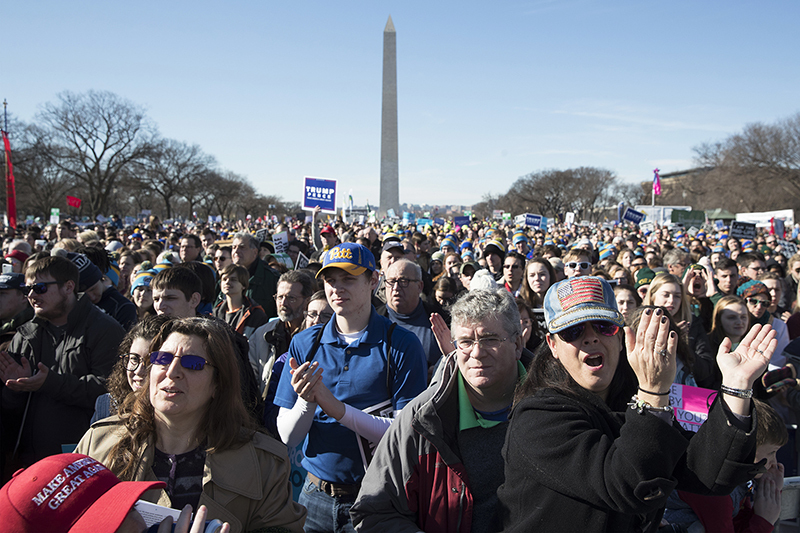 As a student at a major public university, he said being Catholic and pro-life means you often find yourself in the minority, so he appreciated seeing the tremendous crowd in Washington, D.C. The hundreds of thousands in attendance at the March for Life in the nation’s capital also inspired Topeka’s Hayden High School senior Mary Hockenberry. But back in Topeka a few days later, Hockenberry said Ohden’s story of survival moved her perhaps more than any speaker she’s heard at any pro-life event this year or in past years. Ohden survived an abortion, became a pro-life activist and eventually ended up meeting members of her birth family who “just happened” to live in the same cities she did. Like Hockenberry, Isaac Mead, an eighth-grader at Topeka’s Mater Dei Grade School, said he was moved beyond belief. As she shared her story, Ohden mentioned how less than two years ago, nearly four decades after the failed abortion, she was able to meet her birth mother for the first time. “That was so powerful to hear,” Mead said, adding later that coming to the rally surpassed his expectations “all the way” and he was grateful for the opportunity to hear Ohden’s story. Mead’s principal, Andrea Hillebert, said hearing Ohden’s message of healing, restoration and forgiveness provided inspiration. Ohden said when she learned the secret of how her mother had tried to abort her, she forgave her. “I don’t hate her for that,” Ohden said of the abortion. “That’s a lesson for all of us,” Hillebert said.